Far too many still need our help. Please take action and make your gift today by clicking here! Thank you so very much for your support. Click here to learn more about our history, mission, leadership and partnerships. Are you ready to give a day and make an impact in your community? Become a Volunteer! Making the homes of those less fortunate more livable and secure. Founded in 2009, Chesapeake Housing Mission is a non-profit organization that provides vital home repair to low-income families in the Chesapeake Region of Maryland. We are a Christian Mission that believes we are called to help one another. Through volunteerism and donations, to date we have successfully helped over 300 families in need in Maryland’s Dorchester, Somerset, Wicomico, and Worcester counties. 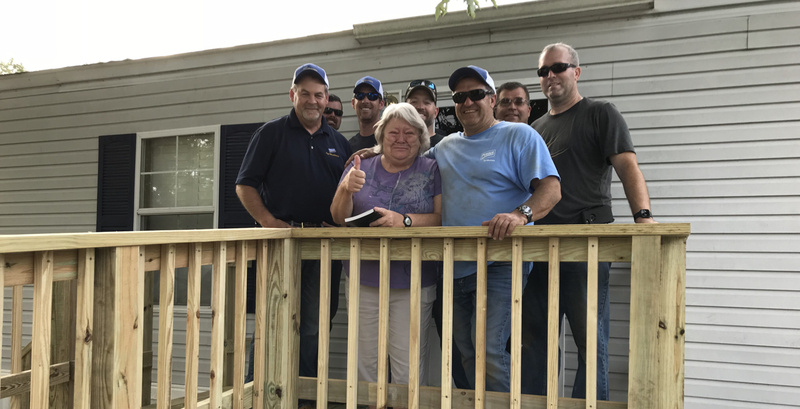 Most of our projects involve building wheelchair ramps, giving back our clients the freedom and independence to remain in their homes. The demand for our services has rapidly increased due to the growing aging population and the number in need. Our clients are identified as living below the poverty level and are referred to us by local agencies. Our partnerships with these agencies helps us to locate those with the greatest need and bring donors and volunteers together to help improve the living situations of our clients. Our Christian Mission to help those in need continues to guide our work. Will you join us by making a donation or volunteering? Everyone deserves a safe and accessible place to live. With your help we can make a difference in the lives of our neighbors!